St. Francis Jerome was born on December 17, 1642, and was the eldest of eleven children. At the age of sixteen he entered the college of Taranto, which was staffed by the Society of Jesus. He studied humanities and philosophy there, and was so successful that his bishop sent him to Naples to attend lectures in Theology and Canon Law. 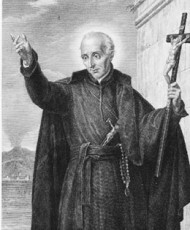 He was ordained in Naples on March 18, 1666. He entered the novitiate of the Society of Jesus on July 1, 1670. He spent four years preaching in neighboring towns and villages. He wanted to preach in the Far East, but his superiors told him to abandon that idea and to focus his talents on Naples. He realized this was the will of God and spent the next forty years laboring in Naples. He devoted himself to stirring up the religious enthusiasm of a congregation of workmen, called the “Oratio della Missione”. The main object of this association was to provide the missionary fathers with helpers. With the support of these helpers, he was dedicated to preaching all over Naples, preaching in the streets, the public squares, and the Churches. He was noted for drawing large numbers, and usually took a stage. Those opposing his preaching would attempt to distract him by setting up singing and dancing next to where he would preach, but his commanding loud voice and style of preaching was simple and impressive, and would take the crowd over. St. Francis Jerome sheltered 190 children in the Holy Ghost Asylum, and had the blessing of seeing twenty-two of them embrace the Religious Life. He worked diligently in bringing Turkish and Moorish slaves of his time, to the true faith. He held elaborate baptismal ceremonies to strike at the heart and imaginations of the spectators. When he wasn’t busy with his preaching in Naples, he would travel to neighboring villages and religious communities to hold retreats and hear their confessions. To aid in his great work, everywhere he went he tried to establish an Association of St. Francis Xavier – his patron and model, or a Congregation to the Blessed Virgin Mary, to encourage and assist them in a structured growth of faith. For twenty-two years he preached Mary’s praises every Tuesday in the Neapolitan Church known as St. Mary of Constantinople. He engaged in active exterior work, but St. Francis Jerome had a mystical soul. He was often seen walking through the streets of Naples with a look of ecstasy on his face and tears streaming from his eyes. He had a reputation of being a great miracle worker, and his wonders and cures are innumerable. He died on May 11, 1716. Pope Benedict XIV declared that St. Francis Jerome had practiced the Theological and Cardinal virtues in a heroic degree. Pope Gregory XVI canonized him on May 26, 1839. St. Francis Jerome was born on December 17, 1642, and was the eldest of eleven children. At the age of sixteen he entered the college of Taranto, which was staffed by the Society of Jesus. He was ordained in Naples on March 18, 1666. He entered the novitiate of the Society of Jesus on July 1, 1670. He wanted to preach in the Far East, but his superiors told him to abandon that idea and to focus his talents on Naples. He realized this was the will of God and spent the next forty years laboring in Naples. He was well known for being a miracle worker, and spent most of his time preaching, converting others to the fullness of the faith.